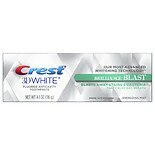 Shop Crest 3D White Brilliance Blast Whitening Toothpaste Energizing Mint (4.1 oz. )4.1 oz. $799$7 and 99 cents$1.95 / oz. 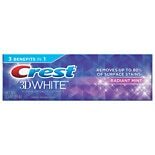 Shop Crest 3D White Whitening Toothpaste Radiant Mint (3.5 oz. )3.5 oz.